A beautiful solid brass urn with highly detailed etching and a rich smoky amethyst finish. (Note: This urn is a soft gray-amethyst color and not a dark purple color.) The lid screws on securely from the top. A free urn bag is included with each large urn. 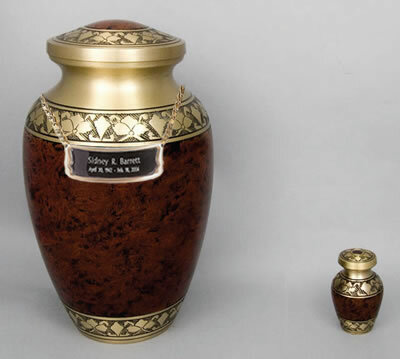 The keepsake is not included with the large urn and must be ordered separately. The keepsakes are a shade darker than the large urn. Optional hanging nameplate available for the adult urn only and will be shipped ground, even for expedited urn orders. Nonengraved items usually ship same day if ordered by 12pm EST. Ships from the East Coast.